Cybex 750R Recumbent Exercise Bike is a versatile recumbent bike for the all fitness enthusiast . The 750R recumbent bike also offers the variety of over 500 programs for the user and unparalleled durability .Cybex 750R Recumbent Exercise Bike performance with the comfort of a wider seat base and supported back. Pedal Design: Extra wide double sided pedal design accommodates any size foot. The easy to adjust pull strap buckle closure gives users the comfort they seek. Single Stage Drive: The self-tensioning single-stage drive and hybrid eddy-current self-generating brake provide high torque capabilities with exceptionally low drag to provide an exceptionally broad resistance range of 20 to 900 watts with superbly smooth operation. Handlebars:Multi-positioned handlebars promote a comfortable hand position with heart rate grips where they are most convenient. Custom Colors: Why stick with silver grey when you can choose from any of our five standard colors (white, black, platinum sparkle, metaltone gold, black chrome)? Or … select from over 180 custom colors to match any decor. Only Cybex offers color customization for cardiovascular and strength equipment. Resistance Range: The 750R’s wide range of resistance (from 20 to 900 watts) can create a challenging or modest exercise experience. 20 Watts is much lower than most other bikes on the market and is important for de-conditioned users. 900 watts “can make a grown man cry” – quote from a veteran cyclist. Front wheels: Because bikes are more mobile than many other exercise machines, they don’t stay in the same place all the time. The 750 cycles have wheels on the front for easy rolling so they can be moved around. Seat Engineering:A Cybex proprietary seat was designed by cyclists to provide comfort for the long ride. You need 3 things: as much surface area as possible for support in the proper areas – while allowing full range of leg motion – while being kind to between the legs – and only Cybex has it.On a Cybex bike riders really can work up a sweat so the seat back is designed with holes for optimized ventilation to keep you cool on any length of ride. Programming: Quick Start, Manual, 9 Constant Power programs including Heart Rate Control, 3 Advanced Programs including manual Speed Control (Isokinetic) and manual Constant Power, and 9 additional Custom Programs. Heart Rate Control allows for direct selection of target heart rate. Heart Rate Monitoring: Includes Contact and Wireless capability (chest strap not included). Multi-color heart shaped LED provides color coded feedback of heart rate. *Note: Most of the sites, stores or shopping portals listed above sell Cybex 750R Recumbent Exercise Bike with discounts and other exciting offers. There is a possibility that the some of above websites are not selling Cybex 750R Recumbent Exercise Bike now. Toughtrain.com is not liable for such cases or instances. 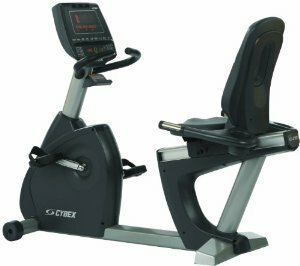 Also we do not recommend any seller for Cybex 750R Recumbent Exercise Bike and a buyer should buy from where he/she gets best deal with quality of products, service and on time delivery (shipment).